(Note 1):Value for using two judgment outputs with 1 sensor head in MZBC mode, with each measuring range set to Max. and light intensity not adjusted (continuous sensing). (Note 2):Value for obtaining displacement shape waveform data using buffering and 2 sensor heads in whole synchronized measurement mode, with each measuring range set to Min. (no OUT calculation). (Note 3):Value for using 2 judgment outputs with 1 sensor head in MSDS mode, with the unit light receiving time set to 40 μs, light intensity not adjusted (continuous), and 2 points selected (without wide cell function). 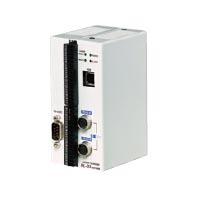 RS-232C interface Baud rate: 9,600, 19,200, 38,400, 57,600, 115,200 bit/s(Note):Products produced from September 2013 (Ver. 2) are also compatible with 9,600, 19,200 and 38,400 bit/s.